Calgary Pride kicked off August 25th with various pride themed dance parties and concerts across the city but there is still so much to do before the pride parade happening September 3rd. If you’re interested in political discussions, film screenings, dancing or drag shows there is a different pride themed event happening in the city almost every night. 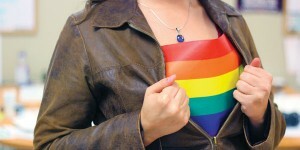 Pride is often considered one big party, filled with rainbows, parades and fun for everyone. If you’re an ally accompanying a friend to Pride this summer or just want to go to be a part of the fun, here’s a list of what you should do and what you should avoid. First all, be polite. This should go without saying. You really don’t need to point out every drag queen or every person wearing a costume. The old adage, if you don’t have anything nice to say don’t say anything at all, rings true. If you’re not sure what you’re going to say could be offensive, it’s better to be safe than sorry. You’re a guest in this space and making sure that those around you feel comfortable should be your top priority. Secondly, don’t out your friends! It doesn’t matter if they’re out to most people, that is for them to do. It’s normal for LGBT+ people in the closet to go to Pride and call themselves allies if they have to cover up. With this comes, if you’re going to an event make sure you have that person’s consent to post about it on social media. It’s even more important to keep this in mind if you know your friend might not be out to all those close to them. If you’re the parent of an LGBT+ child, please ask them if you can go with them but respect their choice if they say no. What’s most important is showing your support. Pride can be an easy way to open up a discussion. Lastly, respect the space. Before going to a pride event look into the history of the pride movement and parades. In Canada especially, it might feel like marriage equality has been a part of our lives for such a long time that there really isn’t a struggle for LGBT+ people. But please look into the issues and educate yourself before you go. So have fun at pride, consider donating to your local LGBT+ center and most importantly show your support, and be there for your friends!